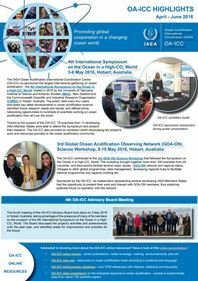 Although increasing the pCO2 for diatoms will presumably down‐regulate the CO2‐concentrating mechanism (CCM) to save energy for growth, different species have been reported to respond differently to ocean acidification (OA). To better understand their growth responses to OA, we acclimated the diatoms Thalassiosira pseudonana, Phaeodactylum tricornutum, and Chaetoceros muelleri to ambient (pCO2 400 μatm, pH 8.1), carbonated (pCO2 800 μatm, pH 8.1), acidified (pCO2 400 μatm, pH 7.8), and OA (pCO2 800 μatm, pH 7.8) conditions and investigated how seawater pCO2 and pH affect their CCMs, photosynthesis, and respiration both individually and jointly. In all three diatoms, carbonation down‐regulated the CCMs, while acidification increased both the photosynthetic carbon fixation rate and the fraction of CO2 as the inorganic carbon source. The positive OA effect on photosynthetic carbon fixation was more pronounced in C. muelleri, which had a relatively lower photosynthetic affinity for CO2, than in either T. pseudonana or P. tricornutum. In response to OA, T. pseudonana increased respiration for active disposal of H+ to maintain its intracellular pH, whereas P. tricornutum and C. muelleri retained their respiration rate but lowered the intracellular pH to maintain the cross‐membrane electrochemical gradient for H+ efflux. As the net result of changes in photosynthesis and respiration, growth enhancement to OA of the three diatoms followed the order of C. muelleri > P. tricornutum > T. pseudonana. This study demonstrates that elucidating the separate and joint impacts of increased pCO2 and decreased pH aids the mechanistic understanding of OA effects on diatoms in the future, acidified oceans. 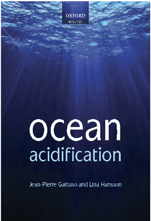 Ocean acidification (OA) is predicted to enhance photosynthesis in many marine taxa. However, photophysiology has multiple components that OA may affect differently, especially under different light environments, with potentially contrasting consequences for photosynthetic performance. Furthermore, because photosynthesis affects energetic budgets and internal acid-base dynamics, changes in it due to OA or light could mediate the sensitivity of other biological processes to OA (e.g. respiration and calcification). To better understand these effects, we conducted experiments on Porolithon onkodes, a common crustose coralline alga in Pacific coral reefs, crossing pCO2 and light treatments. Results indicate OA inhibited some aspects of photophysiology (maximum photochemical efficiency), facilitated others (α, the responsiveness of photosynthesis to sub-saturating light), and had no effect on others (maximum gross photosynthesis), with the first two effects depending on treatment light level. Light also exacerbated the increase in dark-adapted respiration under OA, but did not alter the decline in calcification. Light-adapted respiration did not respond to OA, potentially due to indirect effects of photosynthesis. Combined, results indicate OA will interact with light to alter energetic budgets and potentially resource allocation among photosynthetic processes in P. onkodes, likely shifting its light tolerance, and constraining it to a narrower range of light environments. The world’s oceans are acidifying and warming due to increasing amounts of atmospheric CO2. Thermal tolerance of fish much depends on the cardiovascular ability to supply the tissues with oxygen. The heart itself is highly dependent on oxygen and heart mitochondria thus might play a key role in shaping an organism’s tolerance to temperature. The present study aimed to investigate the effects of acute and chronic warming on respiratory capacities of European sea bass (Dicentrarchus labrax L.) heart mitochondria. We hypothesized that acute warming would impair mitochondrial respiratory capacities, but be compensated after long-term. Increasing PCO2 may cause intracellular changes, likely further constricting cellular energy metabolism. We found increased leak respiration rates in acutely warmed heart mitochondria of cold-conditioned fish in comparison to measurements at their rearing temperature, suggesting a lower aerobic capacity to synthesize ATP. However, thermal acclimation led to increased mitochondrial functionality, e.g. higher RCRo in heart mitochondria of warm-conditioned compared to cold-conditioned fish. Exposure to high PCO2 synergistically amplified the effects of acute and long-term warming, but did not result in changes by itself. We explained the high ability to maintain mitochondrial function under OA with the fact that seabass are moving between various environmental conditions. Improved mitochondrial capacities after warm conditioning could be due to the origin of this species in the warm waters of the Mediterranean. Our results also indicate that seabass are not yet fully adapted to the colder temperatures in their northern distribution range and might benefit from warmer temperatures.